For those who have not yet had the pleasure of experiencing a John Cooper School musical production in its state-of-the-art JCS Performing Arts Center, keep your eyes peeled for the next opportunity. 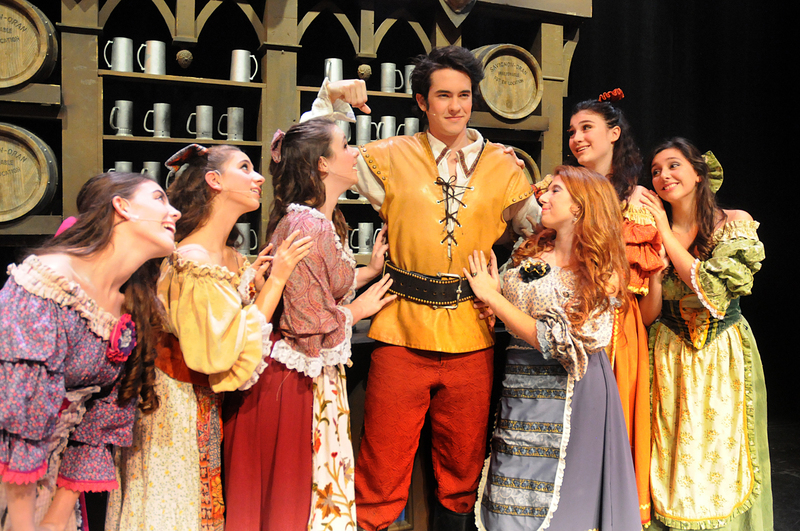 Their recent fall production of Disney’s Beauty and the Beast, ran for just one long sold-out weekend, but was yet another in a growing line of success stories from this exceptional theatre program under the brilliant leadership of director, Joseph DeMonico, choreographer, Elizabeth DeMonico, and musical director, Rae Moses who conducted the superb 12-piece orchestra. The scene was set by a solid opening narration from rich-voiced, Jack Kite. The story is a familiar one with its tale of a selfish and arrogant prince (Jesse Bates) who is turned into a beast by an enchantress (Neha Verma) and cursed to remain so until he learns to find true love through kindness. 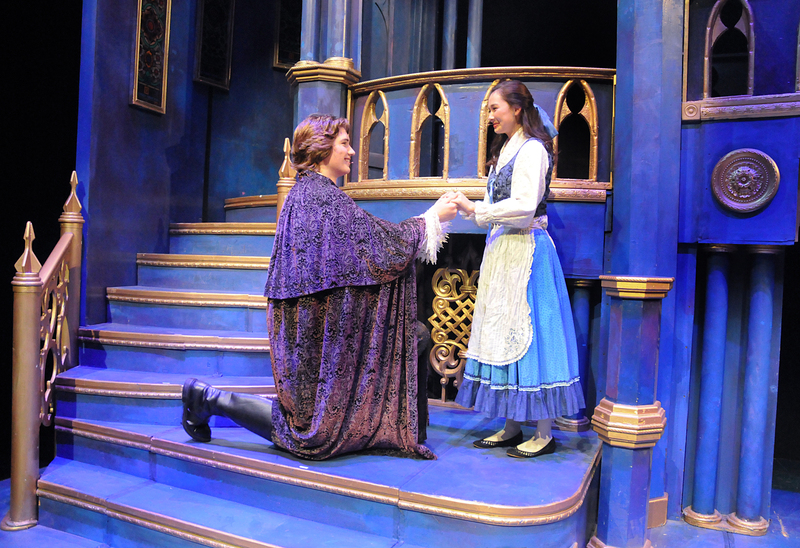 The overall production was first-class, and its luminous young star, Caitlin Finnie, gave a performance that could have been on Broadway in her superb portrayal of Belle, the peasant girl who wins the heart of the beast, after being trapped for a time in his castle. 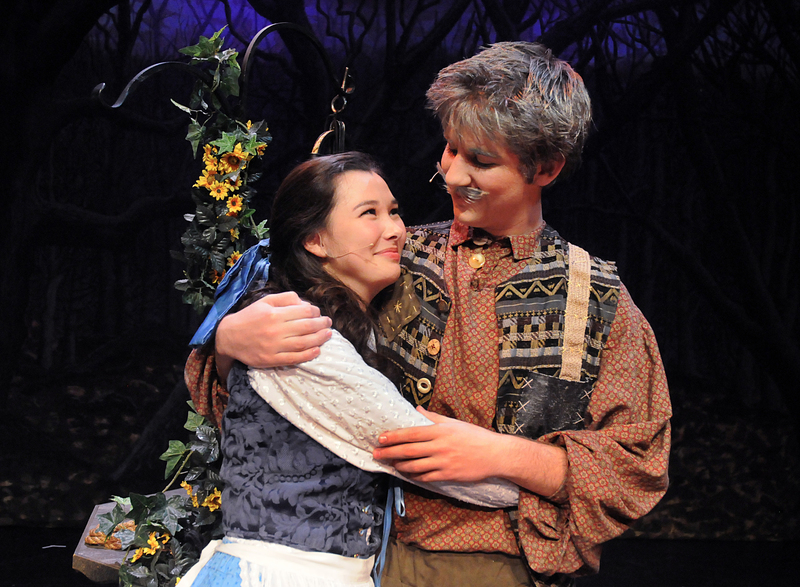 A high school senior, Finnie’s voice is wondrous perfection in one so young. Her acting style is divinely natural, and one can only hope she is headed for a career in musical theatre. I had made note of her exceptional voice in a previous JCS production of 25th Annual Putnam County Spelling Bee, so I was delighted that the printed program for this “Beauty” production made mention of her voice teacher, Donna Hinds, who must certainly deserve special recognition. 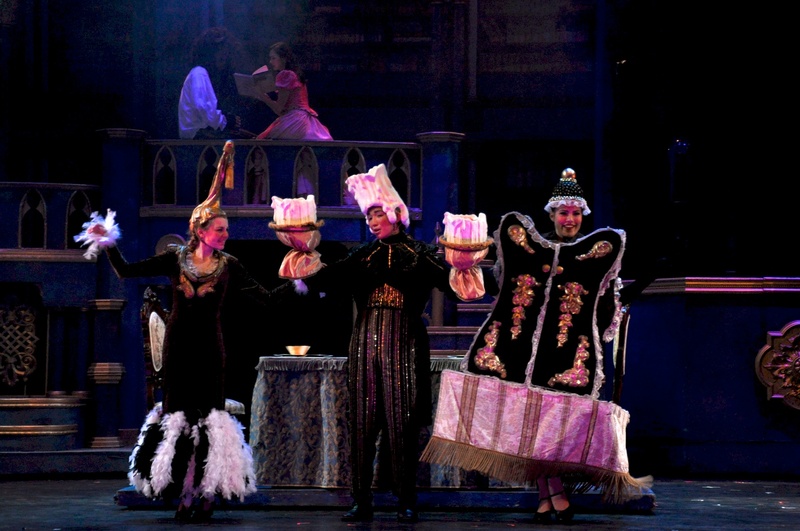 While no set or costume designers were credited in the printed program, it must be said that the sets for this production were simply gorgeous with its storybook depiction of a charming peasant village, Belle’s lovely thatched roof cottage, a somewhat spooky forest, and the ominous, but very grand palace of the beast. 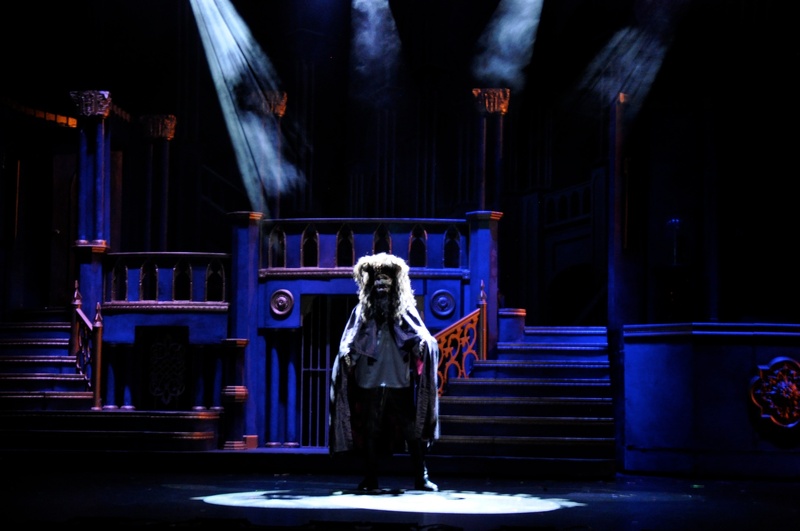 Set pieces glided smoothly from scene to scene, and it was very fitting that the director called the backstage crew out for a much-deserved bow during the curtain calls. As to costumes, they could not have been more delightful, especially those of the magically animated characters in the enchanted palace that included, Cogsworth, the clock (Jeremy Mani), Lumiere, the candlestick (Derek Tam), Babette, the feather-duster (Annabelle Cousins), Mrs. Potts, the teapot (Caroline Davis), her child, Chip, the teacup (Lauren Spearman), and an armoire known as Madame De La Grand Bouche (Jenny Bates). 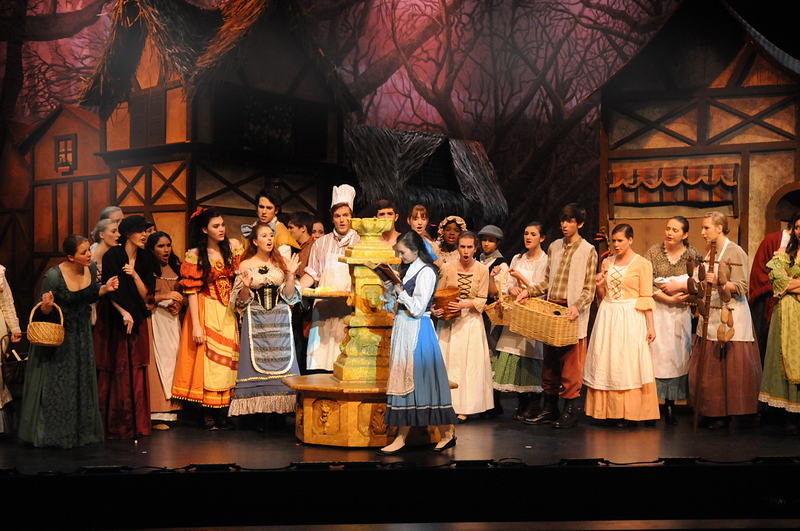 As a mysterious mist filled the forest and the ensemble sang the lovely opening song, “Belle,” the large cast of villagers was in colorful and authentic medieval attire befitting the peasant class. We meet Belle’s papa (David Taylor), an eccentric inventor with a wondrous contraption. With his commanding voice, the tall and handsome Mr. Portela absolutely owns the stage with a bold performance reminding one of the lusty arrogance of Errol Flynn in The Adventures of Robin Hood. Gaston and his dizzy sidekick, Lefou (Alec Udell), join the fine ensemble and a group of “silly girls,” for the dazzling merriment, gay choreography, and beautiful tableaus of the spectacular production number, “Be Our Guest.” It was brilliantly carried off, and I found myself wishing there would be a DVD available of the performance so I could later share with friends that such excellence really happened in a school production. They say, “seeing is believing,” but I could barely believe my eyes. 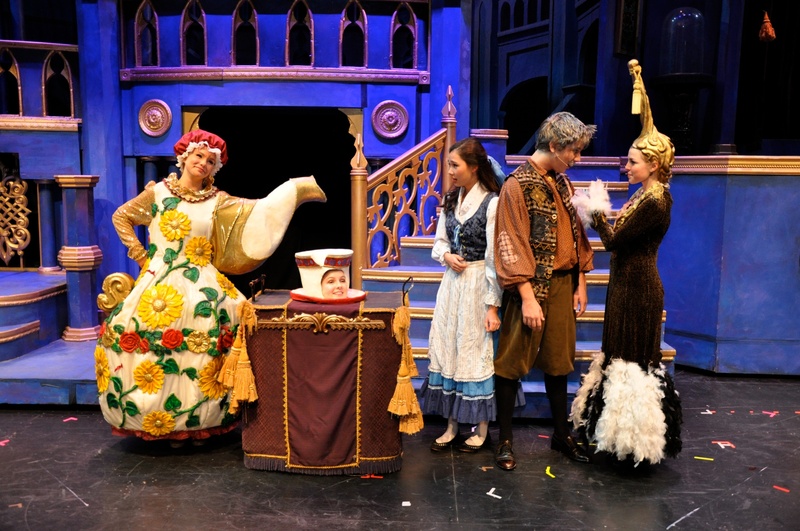 Act Two delights included another whirling and joyful production number with, “Human Again,” featuring Lumiere, Mrs. Potts, Chip, Madame De La Grand Bouche, Cogsworth, Babette and the talented ensemble. It looked like it had popped right out of the Ziegfeld Follies. Meanwhile, Gaston and Lefou hatch an evil plan with Monsieur D’Arque (Matthew Hammarstrom), as they sing, “Maisons Des Lunes.” Miss Davis then hit another homerun for the production with an exquisite rendition of the show’s lovely title tune that was sheer perfection. Mr. Bates anguished portrayal of the desperate and lonely Beast culminates in the heartbreak of his touching performance of, “If I Can’t Love Her.” As Belle reforms the Beast, she sees changes in herself as well. Finnie’s remarkable performance of “A Change in Me” was so exquisitely delivered it left many in the audience breathless in amazement. Who could blame the Beast for falling in love with her? But a frantic final mob scene would first play out right through the audience, with Gaston and his cronies vanquished, and the Beast triumphantly transformed into the handsome prince Belle was always meant to marry. And speaking of triumphant, score another victory for the theatre program at the John Cooper School. Bravo! This entry was posted in Broadway, Miscellaneous Reviews, Theater Reviews and tagged Broadway, Entertainment, Houston, musicals, plays, Reviews, theatre. Bookmark the permalink. The vocals from this amazing ensemble cast soared, characters flew, plates spun, napkins joined Belle in an astonishing kick-line, Lumiere literally ignited with passion, the Beast transformed mid-air, and little girls who attended in their Belle costumes (and, enchantingly, there were many) were invited onstage for pictures with the costumed cast. This breathtaking production truly produced memories that will be cherished for a lifetime. And to think, John Cooper School has four hundred students in the entire high school….amazing!